I wrote and filmed these gardening lessons to give you a walk through a few of the basics to think about when putting in an organic garden. My rainwater barrel is super cool and a good metaphor for water conservation. But I find it interesting to actually run the math and see how little water they hold, and I wonder if they are taking the limelight away from more important organic gardening practices. If your roof is 1000 square feet (100 square meters) and you get 1 inch of rain on a spring Friday afternoon (don’t worry, it had to get it out of its system before the sunny, warm weekend ahead), you will have 625 gallons of water coming off that roof. I don’t know about where you live, but where I live, 1 inch of rain is common. Let’s say you are rain harvesting into a 60 gallon rainwater barrel that will get nice and full and you can use it when organic gardening to water your tomatoes another day. But 90% of that water is going elsewhere, maybe into your city’s sewer system. Your barrel can only take 1/10 inch of rain from that 1000 square foot roof. So while I like the 60 gallon rainwater barrel, I think there are better solutions. A 600 gallon rainwater cistern could handle almost a full inch and a 1500 gallon cistern could easily take 2 inches. Think of it as a giant rainwater barrel. I think every house should have one of these, the size dependant on the amount of rainfall in your area. They can be a bit tricky to fit into the landscape and some people think they are an eyesore, but they can be cleverly hidden or even buried. A more attractive organic gardening solution for rain harvesting would be to build a small pond to catch the water. A pond the size of a king size bed and 2 feet deep would hold your inch of water and if constructed thoughtfully, would provide drinking water for insects and animals. 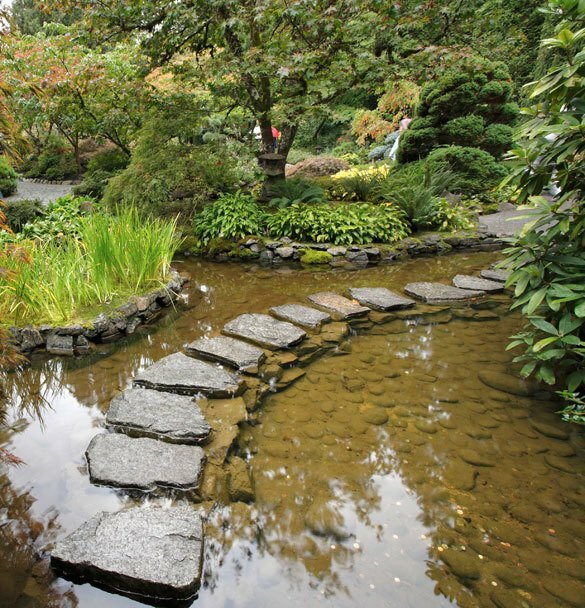 Every organic garden should have some open water in it for this purpose. Mosquitoes aren’t a problem if you keep the water moving and put some effective microorganisms in it, but that’s for another article. While your rain harvesting into a pond, you might as well bring your greywater into it to be cleaned and used as well, rather than piping it to the sewer or septic system. Your sink, shower and laundry water can all be put to use in the garden. Make sure to use non-toxic soaps, shampoos and detergents. What I think we should mostly be focusing on is the soil in our organic gardens. The soil is the best way to hold onto water and makes rain harvesting into a rainwater barrel look like child’s play (not that there’s anything wrong with child’s play). Let’s look at how it works using 1 inch of rain as an example. If your roof is 1000 square feet (100 square metres) and you get 1 inch of rain, you will have 625 gallons of water coming off that roof. A loamy sand, which is 70-85% sand (hence not very good at holding water), can hold 1.1 to 1.2 inches of “plant available water” (plant available water refers to the water that can actually be taken up by plant and microbes and also lost to evaporation; the soil can hold more water than that, but some of it is so tightly held by the soil that it can’t be used). This loamy sand will already be fairly saturated from our 1 inch rain, though, so it won’t take much of the water from the roof. A silt loam, which is 75-90% silt, is great at rain harvesting as it can hold the most “plant available water” at 2 to 2.5 inches. It can handle all of the 1 inch rain if you can spread the roof runoff over 1000 square feet. That might be possible with some smart engineering. A clay soil, which has at least 55% clay, actually holds less plant available water than the silt loam because while it can hold more water, it is held so tightly that plants and microbes can’t get it. It holds 1.2 to 1.5 inches of water, again not much of our roof runoff. There is one thing that we can put in and on our soil that will hold the extra water, and that is organic matter. Organic matter is a rain harvesting genius. I don’t know exactly how much water organic matter can hold, but an article on the USDA website says it can hold 10 to 1000 times more water and nutrients than the same amount of soil minerals. Even if organic matter holds only 4 times its weight in water, you can hold nearly an extra inch of water if you can increase the organic matter content of your soil by 1.5%, easily doable. That means we can now be rain harvesting 2 or 3 inches of rain from the roof, 20-30 times more than your rainwater barrel. This is what organic gardening is all about. Organic matter can be brought in via compost or mulch. Incorporating 2 inches of good compost into the top 12” of a new garden bed will easily increase the organic matter content by 2-3% (although you might as well go for 6 inches of compost while you’re doing it). Mulch goes on top of the soil, but it too holds a lot of water. Now all that’s left is to direct the runoff to your gardens with gutters, and perhaps slight grading of the ground and swales and berms. The rainwater barrels are a nice idea, but they don’t go very far in rain harvesting from the roof. Cisterns and ponds can hold more and should be used, but the winner in this event is the soil and especially organic matter. Most soils are low in organic matter and if that’s the case for yours, bringing in lots of compost and mulch will transform your soil into the ultimate storage tank. There are many mulch types available for your organic garden, but which is the best mulch for you? This article explores some of the most popular types of mulch and ultimately comes to a conclusion with what you should use. What is mulch? It’s really anything that we put on the soil surface to cover the ground. Landscaping fabric is considered part of our mulch because it is often placed on the soil under various types of mulch in order to help control weeds. The cheap stuff doesn’t work very well, but thicker fabric can work for awhile before weeds start to find their way through the cracks or just start on top of the mulch. Unfortunately, that thick landscaping fabric can also stop water from getting down to the soil, especially on a slope where the water just slides down the fabric to the bottom. It doesn’t take long for the landscape to show signs of suffering in this case. But the biggest problem with this fabric is that it doesn’t allow organic matter to recycle into the soil. When you put landscaping fabric on, it means your soil doesn’t get to eat anymore. This is definitely not the best mulch for organic gardening purposes. Soil needs to be consistently replenished with organic matter, so any of the mulch types we choose have to be composed of organic matter. Soil is replenished in nature and in our gardens when leaves fall in autumn, and since many of our gardens are low in organic matter anyway, it also happens when we intentionally bring in more leaves, straw, compost and other organic matter to improve the soil. Putting landscaping fabric in the garden stops all of this and slowly kills the fertility and structure of the soil, and everything living in it. The only potential use is on pathways, since we are compacting them anyway and not trying to increase the organic matter. But we need to look elsewhere for the best mulch. When it comes to choosing a good mulch, we need to think, what is mulch for? Weeds. A continuous thick, dense layer of 2”-4” of one of the best mulch types is one of my favorite ways to control weeds because not only does it smother most of them out, it makes the ones that do find their way through so much easier to pull, especially if you have been clever enough to regularly hit the garden (and the mulch) with some water. We have other organic gardening chores to do, so eliminating most of the weeds is a good goal. It may be necessary to kill some tap-rooted or perennial weeds before placing the mulch on top of them. In addition, maintaining a dense, multi-layer plant cover on your soil consisting of a groundcover below and flowers, shrubs and trees above will stop most weeds from growing. Soil Health. The best mulch types are persistently and continuously working to improve the health of the soil. They are being broken down by microbes and increasing the organic matter content of the soil. Organic matter is an incredibly important part of the soil. It improves soil structure, and as it is broken down, its nutrients are releasing into the soil, making it one of the only types of mulch that improves fertility. It prevents compaction from us walking in the garden and erosion from the wind or gravity on steep slopes. It also moderates the soil temperature, which is good for anything (plant, animal and microbe) living there. Water. Organic matter is the best mulch because it is broken down into humus, which has an incredible ability to hold onto lots of water. But even before it is broken down, mulch holds a lot of water on its own and allows it to more slowly infiltrate into the soil. It also reduces compaction (and leaching of nutrients) caused by a heavy rain, and erosion that happens when a lot of rain falls and there is runoff. Conversely, when the sun is shining, it also prevents evaporation from the soil surface. So the best mulch actually improves the biodiversity of your entire soil ecosystem by giving all manner of critters a place to live, food to eat and water to drink. It even looks good in the organic garden if one of the right types of mulch is used. 1. Stones or gravel provide some of the benefits in that they protect the soil from erosion and decrease evaporation, but they do not breakdown and so do not do much to improve soil health. They are not one of the best mulch types. 2. Bark mulch and wood chips are some of the most commonly used mulching materials in the garden. They have some benefits and some potential downsides. They do most of the above things well, but unfortunately, they have a couple of issues making them one of the types of mulch I don’t tend to use. The first is that they are very high in carbon and very low in nitrogen. This means that the beneficial microbes in the soil may pull all of the available nitrogen from the surrounding area in order to be able to eat the wood, which often ends up causing a nitrogen deficiency in your soil and plants. This is more of an issue when you incorporate the mulch into the soil, and doesn’t seem to cause as big of a problem when the mulch is left on top. Bark in particular is low in nutrients (so it doesn’t improve soil fertility) and often high in toxins (it’s a tree’s first line of defense against pests), so it causes toxicity problems in the soil. It even contains oils that repel water, rather than more appropriate mulch materials that will hold onto water. Wood chips are a little better, but there is another mulch coming up soon that is more in line with nature. Twigs and small branches, on the other hand, have been shown to be much more beneficial that wood chips. They contain more nutrition and don’t cause the nitrogen deficiency problems either. 3. Straw and Hay are not the most aesthetically pleasing, but they are fairly good types of mulch. They’re used in organic gardening, but the main issue for most people will be that they’re not always easy to find and they break down so quickly that they have to be applied multiple times a year. You may not want to use straw or hay from ryegrass as it has toxins in it, and definitely not from grass that has been sprayed with pesticides such as Roundup, which is common in many countries. The difference between straw and hay is that hay has many more seeds, so it will often actually produce weeds. 4. Grass clippings are not the best mulch to use in organic gardening because they get so tightly packed together that they inhibit air circulation. Besides, they are far too important for the soil of your lawn to bring into the garden. They do not contribute to thatch or any other lawn problems, but they provide many benefits so they must be left there. If you have extra though, a tiny amount could be used as a part of your mulch. 5. We’re getting closer to our my favorite of all mulch types, but not yet. With all this talk about organic matter, why not just use compost? A little bit of thought tells us why. It does a lot of things right, but fails to stop the weeds! The same goes with manure, and manure needs to be composted before applied to soil anyway. We should use compost and manure, but they are not really the best mulch. I cover compost in detail in the Smiling Gardener Academy along with cover crops because they are both excellent ways to increase the organic matter content of the soil, but here, we’re looking for the best mulch. What is mulch, I mean the best mulch – what is it? It’s organic matter and it’s provided by nature. In a well-designed organic garden, this is one of the only types of mulch that magically appears in our beds in autumn, protecting the soil over winter, and breaking down throughout the following spring and summer until a new batch magically appears in autumn. Of all the mulch types, by far the best for organic gardening is: leaves! They do absolutely everything right. That’s why when we’re designing our gardens we want to make sure to use plants that make a lot of leaves – not just evergreens – and we want to design the beds to catch all of these leaves. Those that fall on the lawn and non-garden surfaces can be raked into the gardens or mulched right on the lawn. If you don’t have enough leaves, your neighbors will usually be happy to give you theirs, since they would otherwise have to rake them up and dispose of them. In many cities, you can rake your leaves to the curb and a big truck will come by to pick them up. But why would you want to give the best mulch ever away unless you have too many? Ironically, some organic gardeners do this and then buy the leaves back as leaf mould in the spring. Leaf mould is just leaves that have been slightly decomposed. Leaf mould is one of the best mulch types, too, but in most cases, the gardener would have done much better to save the money and keep the leaves in the garden over winter where they can protect the soil. If you have a thick enough layer of leaves in your garden (2″ to 4″ is nice), many weeds will be smothered. You will still get some weeds, but they will be so easy to pull that it won’t matter. You can just drop them back on top of the leaves to become part of the best mulch ever. Some people think leaves are not one of the most attractive types of mulch for the garden, but is a forest floor unattractive? Or is the forest floor covered in 2 inches of bark? We’ve been conditioned to think that bark mulch or bare soil is the most aesthetically pleasing, but if you covered your organic garden in a rainbow of autumn leaves, I think you’ll see it differently, especially now that you know all the benefits they provide. When we remove the leaves, we are breaking nature’s cycle and creating more work for ourselves. So leaves are the number one best mulch. There is one other organic gardening material that doesn’t take the place of leaves as the ultimate of all the types of mulch, but it is beneficial to have as well. It’s called a living mulch, i.e. plants. A living mulch is a dense plant cover on the soil, especially low growing “cover” crops. These can be annual crops (also known as green manures) that we plant in our vegetable gardens to protect the soil during certain times of year and to provide organic matter to the soil, or perennial plants (also known as groundcovers) that live permanently in our ornamental gardens underneath our flowers, shrubs and trees. A good goal is to make sure all of your soil is consistently covered with plants, and cover crops help achieve this goal. Plants send out hormones in the vicinity of their roots that tell weed seeds not to grow. As long as your organic garden is dense with plants and leaves (the best mulch ever), and your lawn is dense with healthy grass, those weed seeds will mostly stay dormant and you have a whole list of other benefits to which you can look forward. 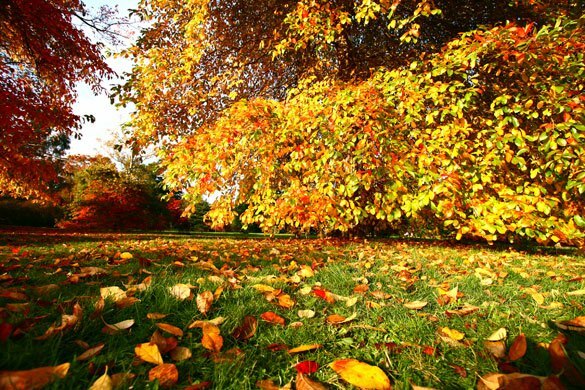 It is possible to have too many leaves if you have a lot of big trees or if your beds are already covered in groundcovers and you don’t want to totally smother them. In that case, you may just have to compost them or give some away, to a friend or to the city, although I have mulched 12 inches of leaves into some lawns with great success. Actually, when I was a kid, I recall my dad would pile a bunch of leaves in the back of the pickup truck (we lived in the country), head down the street to where there were no houses, drop the tailgate, and hit the gas. It was so much fun watching the leaves get caught by the wind and cover the sky like a thousand red and yellow butterflies. In hindsight, I have no idea why we did this, but it was fun at the time. I know someone reading this is wondering about oak leaves. I’ve never had a problem with the fact that oak leaves don’t break down quickly. I’ve always enjoyed that about them because it just means my mulch stays around longer. And nope, they don’t acidify the soil. But again, if you have too many, don’t force it. Feel free to ask a question or comment below. Gardeners ask how to improve clay soil more often than about improving sandy soil, but the reasons are generally the same, and the main reason has to do with water. (I go into much more detail on how to improve both clay and sandy soil in my online gardening course). In many gardens, clay doesn’t infiltrate and drain fast enough and sand drains too fast. 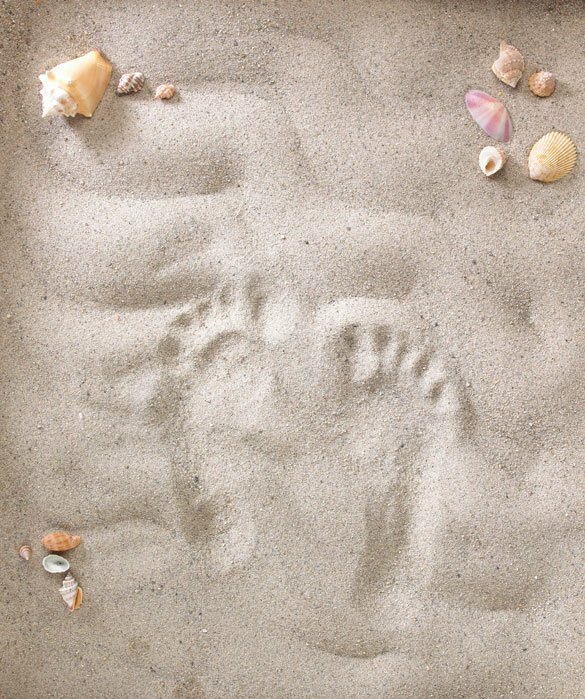 One of the most commonly given pieces of advice on how to improve clay soil is to add sand. When it comes to improving sandy soil, the advice is often to add clay. Both of these are poor organic gardening practices. Before we go into why, we need to take a quick look at how water moves through the soil. Trust me, this is really good to know and quite interesting. Water moves downward after rain or irrigation and upward to eventually evaporate from the soil surface. This water flows through the open “pores” between soil particles. In any soil that is not dominated too much by sand, silt or clay, approximately half the soil volume is pore space. Water and air share this pore space. When soil is entirely saturated with water, gravity forces the water to move very quickly through the big pores, but the rest of the time, gravity doesn’t play as big a role in how water moves through the soil. 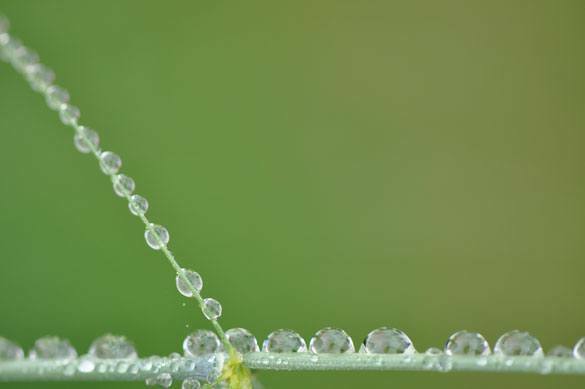 The rest of the time, adhesion (how water molecules tend to stick to other surfaces) and cohesion (how water molecules tend to stick together) govern the movement of water in the soil. Interestingly it moves out in all directions fairly equally – up, down and horizontally. It moves downward only slightly more due to gravity. So let’s say it’s a beautiful Saturday morning and you are doing some organic gardening. Let’s look at what happens when you have layers in your soil. Let’s say you have a clay or silt loam soil that doesn’t infiltrate or drain well. What happens if you add 6 inches of a coarser soil such as a sandy loam on top of a the soil? When it rains, the water slows down when it hits that fine soil layer as you might imagine, although it does continue to move through. Still, it slows down, which is the opposite of what you were going for. If you instead rototill the sand into the clay, it doesn’t create a nice soil texture like you would think. The sand just gets embedded in the clay and often forms a soil environment that is like concrete. When deciding how to improve clay soil, adding sand is not the answer. This part is really interesting. Let’s reverse it and say you have a sandy soil that doesn’t hold water. What happens if you add 6 inches of a finer soil on top of a coarser soil below? This also may happen if the builder brought in some topsoil that was clay based and put it on top of your sandy subsoil. When it rains, you might think the water would speed up when it hits the coarse sandy layer, but in fact, water movement stops until the soil becomes nearly saturated above. Even more interesting, if the finer soil is on an extremely coarse sand or even gravel, the finer soil must become very wet before water will move down through the coarse layer. In this case, the overlying soil can hold two or three times as much as it normally would. These same principles are often used when making golf greens. A layer of gravel is used underneath the sandy soil for the green in order to create a situation where water will stay in the upper layer of sandy soil and be available to the short roots of the grass on the green, rather than draining away. But doing this in a home organic garden is dangerous because you may create the opposite problem, which is a very waterlogged soil, or you may make a soil that is like concrete if you rototill the coarse and fine soils together. The answer is the same for both: organic matter. Compost is what I’m generally referring to. Amend soil with 6 inches of good compost. Work it right into the top of a clay soil and it will improve infiltration and will probably improve the amount of air and water available to your plants. Back to compost. Improving sandy soil with 6 inches of good compost will drastically improve the water-holding capacity of the soil. Since we’ve been learning about how to improve clay soil and improving sandy soil and specifically about water moves through the soil, I’d like to mention a couple of other important organic gardening implications of what we’ve learned about amending soil. Take patio pots for example. Gardeners will often put a layer of gravel in the bottom of a container to improve drainage, but as we have seen it actually does the opposite. The soil on top has to be very saturated before the water will drain through. This is not necessarily a bad thing with the right plants, but it is important to know how this works. The other main implication is with regards to organic matter. If you amend soil by turning in (burying) coarse organic matter such as leaves or straw and they end up buried in a layer, or if you drop 6 inches of soil on top of a big layer of coarse material such as sticks or straw, you could be creating a coarse layer underneath a fine layer. This is the same situation where that soil will get very wet before water will drain out. If straw is incorporated very well, this will not occur, but if it is just turned under, it will. 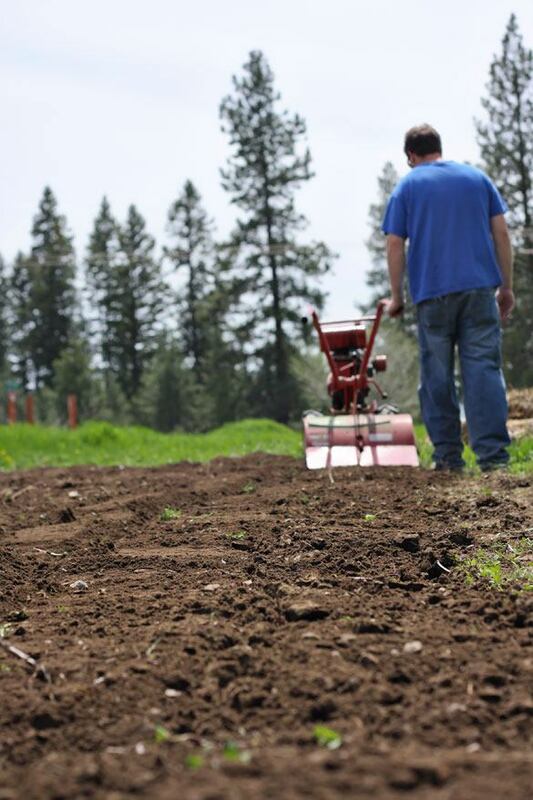 If you need to bring soil into your yard in order to build your garden, you must make sure to rototill it in to the existing soil extremely well. If you just drop it on top, you are inevitably creating an interface that will slow drainage. And try to find a soil that has a similar texture to your exiting soil (i.e. if your soil is clay, bring in more of a clay topsoil than a sandy topsoil). Also, use compost for perhaps 25% of the mix. Is there anything organic matter can’t do? Garden tilling is often done with a gas-powered rototiller that goes down perhaps 6 or so inches, or tilling soil can be done with a tool such as a pitch fork, too. So what is tilling? However you do it, you’re turning the soil over so some of the lower soil comes up and some of the upper soil goes down. To till or not to till has been a hot topic for decades and continues to this day. I get into it in more detail in the Academy. I’ve researched this extensively and find that arguments on both sides make a lot of sense. I’ve also found personally that by correctly tilling a garden or following a no-till method, excellent results can be achieved. The main reason tilling soil can be useful in the short term is to get organic matter incorporated into the soil of a new garden bed or a fallow vegetable garden. If you’re preparing a new garden in a soil that is very low in organic matter, you might bring in 3-6 inches of compost and till it in as deep as a rototiller will let you. You would do this knowing that it may take a few years for the soil structure to repair and produce a great crop, but it’s often worthwhile if the organic matter was low to begin with. Garden tilling helps you get that organic matter down in there to create a deeper soil that encourages plant roots to go down. Double digging is another useful method to accomplish the same thing. Research shows you can get more carbon and humus formation in a tilled soil. I could see this being the case because most of this research is done on conventional (non-organic) farms. No-till farming often uses a lot of chemicals that decimate the soil food web, so organic matter left on the surface isn’t going to break down. However, in a soil with an abundant soil food web, earthworms, insects and fungi can get up on the surface and work on the organic matter. Another argument for tilling a garden is that it gets the organic matter down into the soil where it can be broken down, whereas if it stays on top, more of the carbon is volatized into the air. This is true. But other research shows that if no-till is used with sufficient existing biomass, both the supply of nutrients and good soil structure can be maintained. This is especially true if you have tilled in compost and green manures for the first couple of years to bring up that biomass. In the long run, I am more likely to do just shallow garden tilling to a couple of inches deep, mostly by hand. The main reason you might do this shallow tilling is to lightly incorporate the organic matter from a cover crop or this year’s veggies or compost, as this does hasten decomposition and promotes more humus formation and less volatization of carbon into the air. If you stay shallow, you won’t have as detrimental of an effect on soil structure, dormant weed seeds, microorganisms and earthworms. Even still, do this minimally and carefully in order to limit the disturbance. More and more I am sheet mulching to prepare a new garden bed, which involves layering organic matter 12 or so inches high right on top of the grass/soil. It takes longer for the organic matter to get down into the soil, but you don’t cause the drastic soil structure damage associated with tilling soil. People have had great success doing this, but I mostly prefer to do it when I know I have a decent organic matter content in the soil already. Something else I sometimes do for fun is do half of a bed with the garden tilling or double digging method and half with the sheet mulching method and see which does better over the years. The other main reasons gardeners may till the soil are to: make the soil look fluffy and nice, allow more air and water into the soil, loosen and warm up the soil in spring for planting/seeding, reduce weeds, and relieve compaction. Tilling soil is generally a short term solution for all of these. 1. One we can get rid of right away is “to make the soil look fluffy and nice,” not that the goal isn’t achieved, but that the goal is arguably unreasonable. We have learned to think of bare, fluffy soil as being the most attractive look for our gardens. I understand this – and tilling is a good fluffer-upper – but I also think leaf mulch and other mulches are attractive. That’s what you see in a forest, not bare soil or several inches of bark mulch for that matter. As organic gardeners, one of our goals is working more with nature. It doesn’t mean we need to have a messy garden, but we definitely aren’t going for cleanliness like a living room floor. 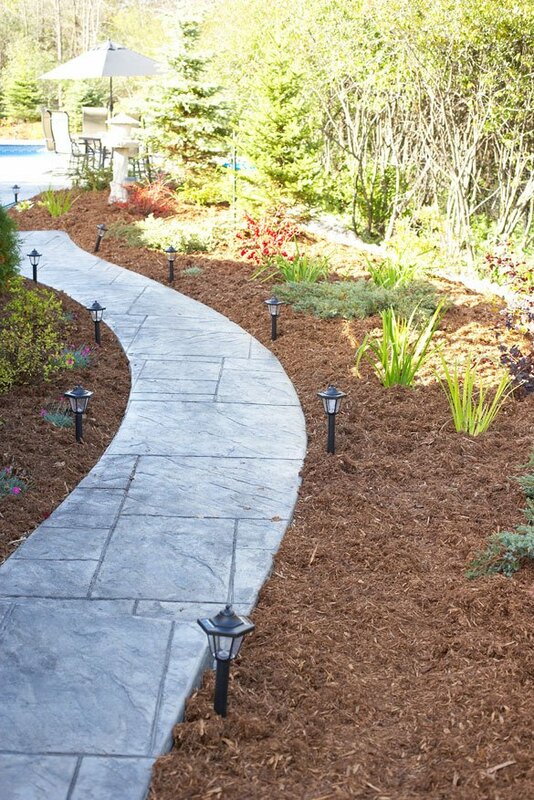 If you want to put a wood mulch on to make it look tidy, it would generally be better to not use bark, and preferably it would be from hardwoods, not softwoods such as cedar and fir. 2. Another reason a person might end up tilling a garden is to allow more air and water into the soil. This does happen in the short term, but the soil will eventually revert to its original structure because soil structure is a function of the soil texture, fertility and biology in the soil. It may even get worse if you burn up too much organic matter and kill all your fungi. A similar reason for garden tilling is to loosen and warm up the soil for spring planting and seeding. This can be done lightly with a hoe or garden fork if you want, but there’s no need to slide and dice everything. The long term solution for improving air and water is balancing the nutrient ratios, increasing organic matter and improving the soil food web. The details of how to do this are too long for one article. The process can take a few years, so tilling soil during the transition may be worthwhile. Even better might be to do it manually with a garden fork to avoid the violent soil movement from a rototiller. 3. Yet another reason to till is to kill weeds. Again, this is a short term measure because the weeds are killed and new ones come in. In fact, while annual weeds will have been killed, many perennial weeds may have been cut into pieces that all come back as new weeds. While your vegetable seeds now have perfect conditions in which to germinate, so do all of the weed seeds that were lying dormant lower down in the soil. Farmers have developed various plows that are effective at knocking down weeds on the surface, but a rototiller is more muscle that is wanted for this purpose. The gardener’s version of the farmer’s plow is a hoe. The long term weed management strategy is the same as up above – balancing the nutrient ratios, increasing organic matter and improving the soil food web – plus mulch and cover crops. 4. The last reason for garden tilling is to relieve compaction. As stated above, soil structure is not only a mechanical problem. It’s a chemistry, biology and physics problem. We need to establish a healthy, diverse population of microorganisms and earthworms, build our humus and balance those nutrient ratios in the soil. A balanced soil acts like a sponge. You can drive across it with a heavy tractor and it won’t compact. If the calcium:magnesium ratio is less than 7:1 and/or there is more than 70 ppm sodium, the soil will compact, but if we can get those numbers in line along with the phosphate:potassium ratio, compaction is gone. How to balance those nutrient ratios is a big topic. So you can see how in the short term the above organic gardening goals are often satisfied, but other than the important goal of getting organic matter incorporated, tilling soil can sometimes cause more problems than benefits, especially if done often and if done too deeply. The main disadvantage is the effect on beneficial microorganisms and earthworms, both of which are absolutely essential to the health of the soil. Upon deep tilling a garden, some of the microbes that need oxygen are buried, killing many of them. Some of the microbes that can’t live with too much oxygen are brought to the surface, killing many of them. Tilling soil causes the miles and miles of beneficial fungi to be sliced into pieces. Those fungi provided important nutrients to the plants, so that is no longer happening after tilling. 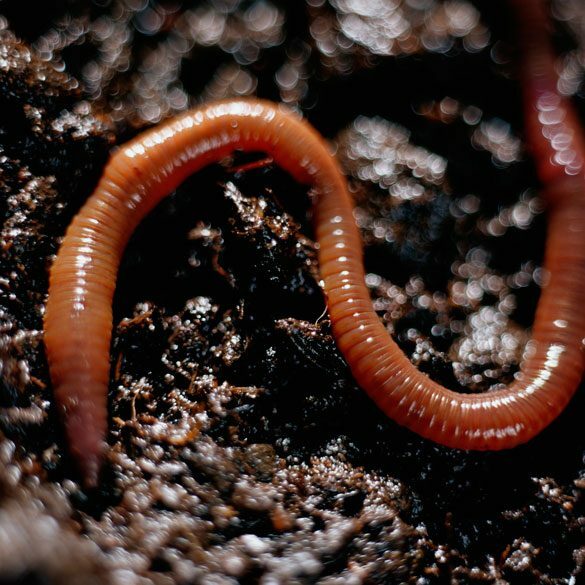 Earthworms are also killed and their tunnels destroyed. All of these critters had taken a long time to find the perfect spot for themselves in the soil. They worked day and night to build themselves little homes and communities. It can take years for this to happen and garden tilling destroys that all very quickly. Perennial flowers, shrubs and trees prefer fungal-dominated soil, so if we’re trying to establish a shrub garden or grow trees, it makes sense to leave the mulch on the surface rather than tilling it in. If we’re tilling our gardens, we cut these fungi all to pieces, resulting in a bacterial-dominated soil. This is more conducive to growing annual vegetables, but we still want some fungi in these soils, too. Another big problem is that soil structure can be decimated if the soil is too wet, especially clay soil. Tilling soil when it is wet causes long term structural damage to the soil that can last for years. It’s much better to wait a couple of weeks and plant late, rather than working wet soil. While the initial influx of air and water after tilling soil breaks down the organic matter more quickly, and releases nutrients to allow microbes and plants to flourish for a short time, that organic matter is oxidized faster than it is replenished. Annual deep garden tilling without adding more organic matter can cause a gradual decrease in organic matter in the soil. This decreases soil fertility, nutrient-holding capacity, water-holding capacity and hurts soil structure. If the soil is left bare, it can crust over so that water runs off and causes erosion instead of infiltrating. So what is tilling good for? We can see that tilling a garden has advantages and disadvantages. Tilling can be successful in vegetable gardens over the long term if organic matter is brought in every time. No-till and sheet mulching can be successful over the long term, especially if the soil had some humus to start with. I think the main reasons people may believe strictly in one of these camps may be because the theory makes the most sense to them, or because they have had success using that method in their garden. The bottom line is that one of the methods will work best in your garden, and a combination of the two may even be optimal. I may till in some compost in the beginning if my soil is very low in organic matter, and no-till and sheet mulch in future years. I definitely opt for no-till long term in order to establish a healthy soil food web. You may want to experiment to see what works for you. Interesting, right? Let me know your thoughts below. Planting a garden is simple when you’ve done some proper garden soil preparation. Before you prepare the bed, you’ll want to think about supplementing nutrients. Today I’m going to cover the organic soil amendments you can feel free to use even if you didn’t take a soil test first.